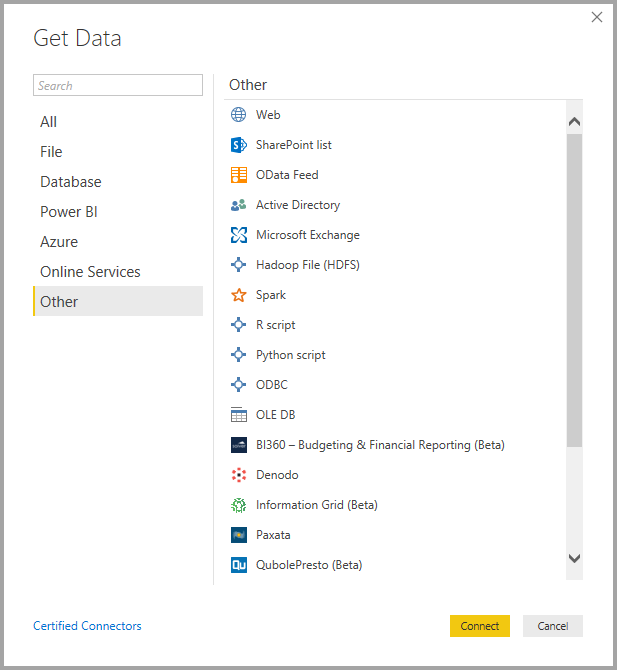 有了 Power BI Desktop，您可以從許多不同來源連接至資料。With Power BI Desktop, you can connect to data from many different sources. 在此頁面底部有可用資料來源的完整清單。A full list of available data sources is at the bottom of this page. 選取 [其他...]，Selecting More… 該選項來自 [最常見] 功能表，如此即會顯示 [取得資料] 視窗。from the Most Common menu displays the Get Data window. 您也可以藉由直接選取 [取得資料] 圖示按鈕，叫出 [取得資料] 視窗 (並略過 [最常見] 功能表)。You can also bring up the Get Data window (and bypass the Most Common menu) by selecting the Get Data icon button directly. 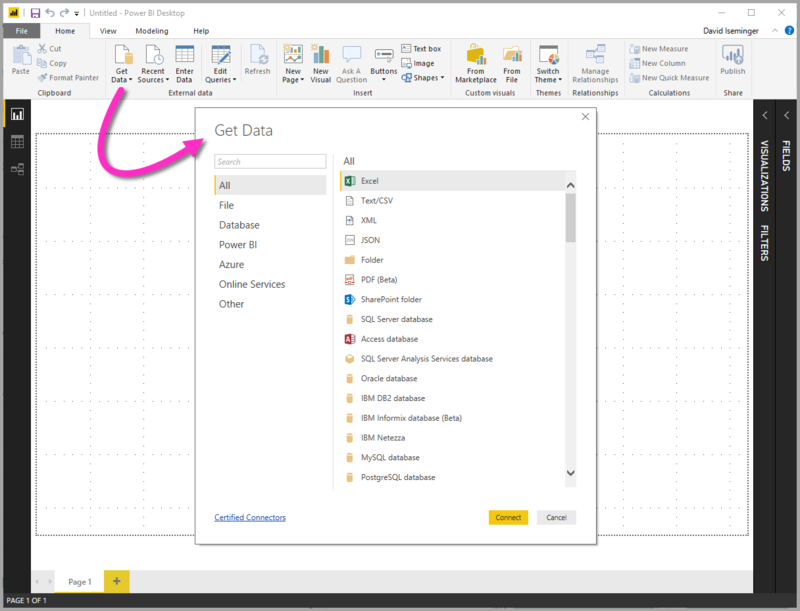 Power BI 小組會持續將可用的資料來源擴充到 Power BI Desktop 和 Power BI 服務。The Power BI team is continually expanding the data sources available to Power BI Desktop and the Power BI service. 因此，您經常會看到舊版工作進行中的資料來源標示為 Beta 或「預覽」。As such, you'll often see early versions of work-in-progress data sources marked as Beta or Preview. 任何標示為 Beta 或「預覽」的資料來源，受到的支援和功能都有限制，不應該用在生產環境。Any data source marked as Beta or Preview has limited support and functionality, and should not be used in production environments. [全部] 類別包含所有類別的所有資料連線類型。The All category includes all data connection types from all categories. 下圖顯示 [檔案] 的 [取得資料] 視窗。The following image shows the Get Data window for File. 某些資料庫連接器的啟用方式為選取 [檔案] > [選項和設定] > [選項]，然後選取 [預覽功能] 並啟用該連接器。Some database connectors require that you enable them by selecting File > Options and settings > Options then selecting Preview Features and enabling the connector. 如果您沒有看到上述連接器，但想要加以使用，請檢查您的 [預覽功能] 設定。If you don't see some of the connectors mentioned above and want to use them, check your Preview Features settings. 亦請注意，任何標示為 Beta 或「預覽」的資料來源，受到的支援和功能都有限制，不應該用在生產環境。Also note that any data source marked as Beta or Preview has limited support and functionality, and should not be used in production environments. 下圖顯示 [資料庫] 的 [取得資料] 視窗。The following image shows the Get Data window for Database. 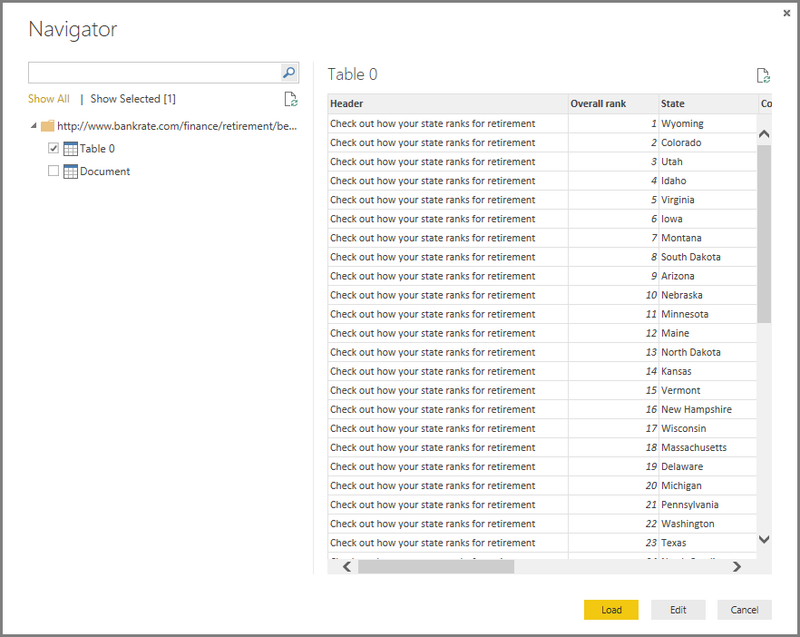 下圖顯示 [Power BI] 的 [取得資料] 視窗。The following image shows the Get Data window for Power BI. 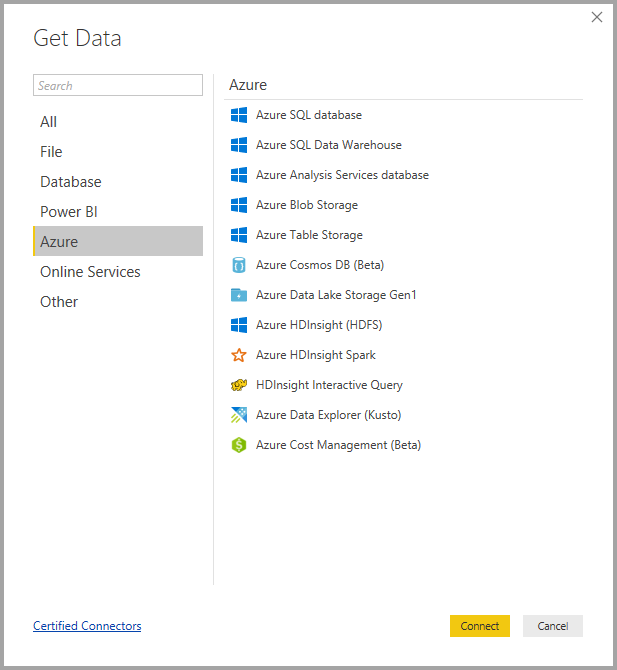 下圖顯示 [Azure] 的 [取得資料] 視窗。The following image shows the Get Data window for Azure. 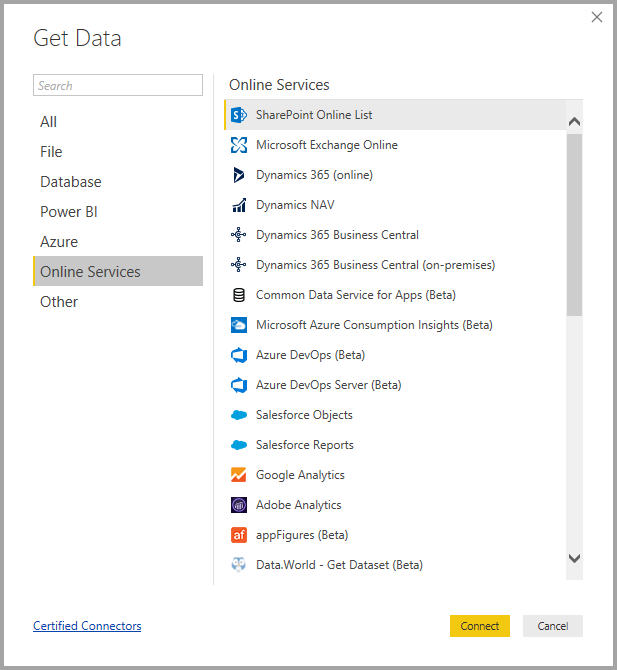 下圖顯示 [線上服務] 的 [取得資料] 視窗。The following image shows the Get Data window for Online Services. 下圖顯示 [其他] 的 [取得資料] 視窗。The following image shows the Get Data window for Other. 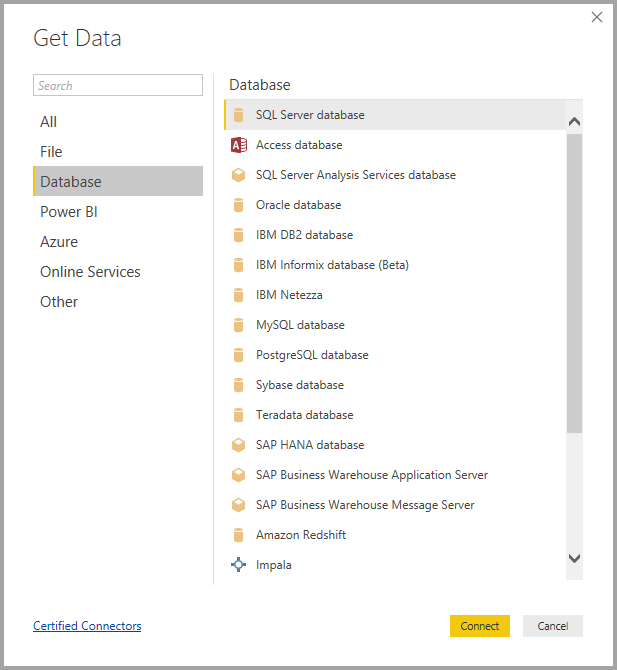 目前無法連線至使用 Azure Active Directory 保護的自訂資料來源。At this time, it's not possible to connect to custom data sources secured using Azure Active Directory. 若要連接至資料來源，請從 [取得資料] 視窗選取資料來源，然後選取 [連接] 。To connect to a data source, select the data source from the Get Data window and select Connect. 在下圖中，從 [其他] 資料連線類別選取了 [Web] 。In the following image, Web is selected from the Other data connection category. 隨即會顯示資料連線類型特有的連線視窗。A connection window is displayed, specific to the type of data connection. 如果需要認證，將提示您提供它們。If credentials are required, you’ll be prompted to provide them. 下圖顯示輸入 URL 以連接到 Web 資料來源。The following image shows a URL being entered to connect to a Web data source. 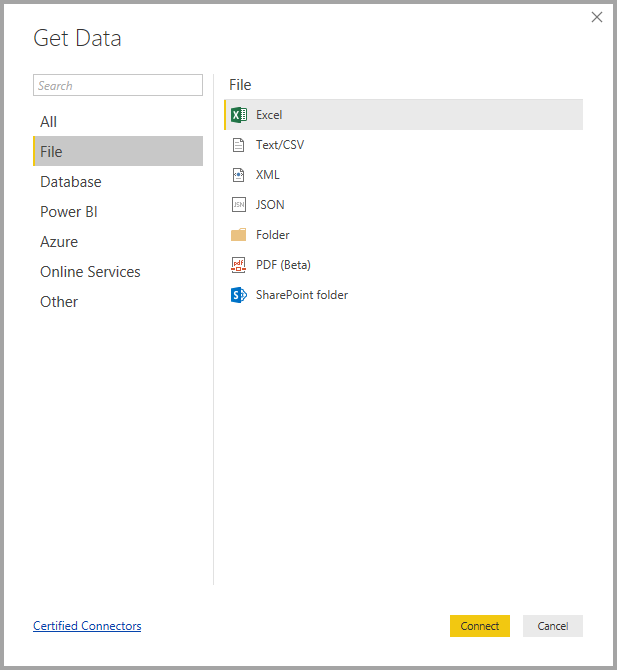 輸入 URL 或資源連線資訊之後，請選取 [確定] 。When the URL or resource connection information is entered, select OK. Power BI Desktop 會建立資料來源的連線，並在 [導覽器] 中呈現可用的資料來源。Power BI Desktop makes the connection to the data source, and presents the available data sources in the Navigator. 您可以選取 [導覽器] 窗格底部的 [載入] 按鈕來載入資料，或是選取 [編輯] 按鈕，在載入資料之前先編輯查詢。You can either load the data by selecting the Load button at the bottom of the Navigator pane, or edit the query before loading data by selecting the Edit button. 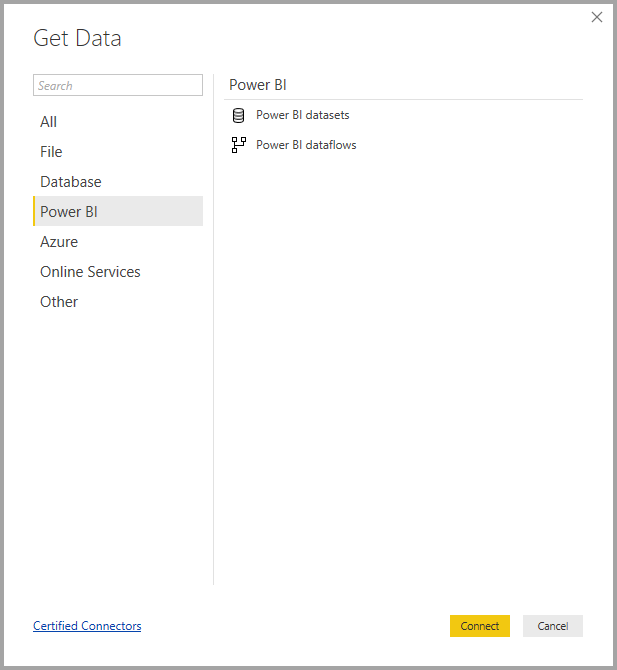 這就是連接到 Power BI Desktop 中資料來源的全部資訊！That’s all there is to connecting to data sources in Power BI Desktop! 嘗試連接到我們持續增加的資料來源，並經常回來查看，我們隨時會增加新的來源。Try connecting to data from our growing list of data sources, and check back often - we continue to add to this list all the time. 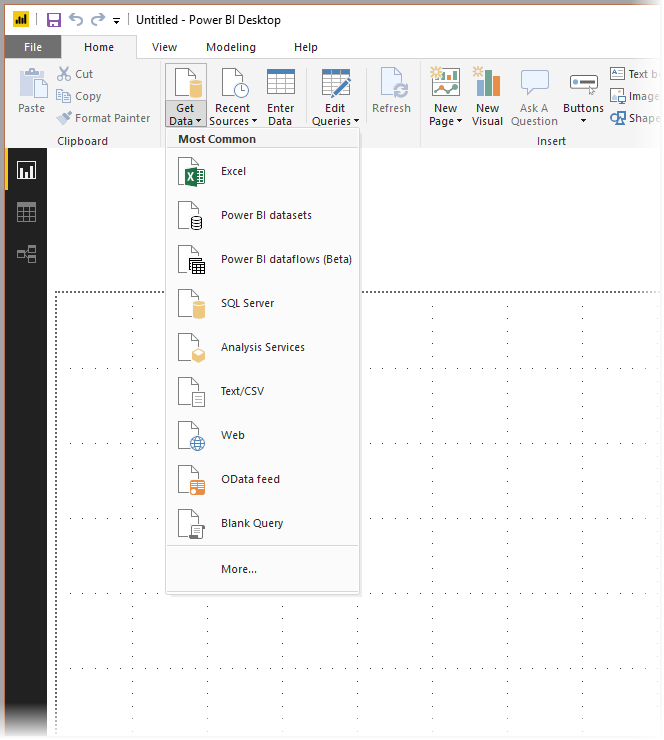 Power BI Desktop 是什麼？What is Power BI Desktop?